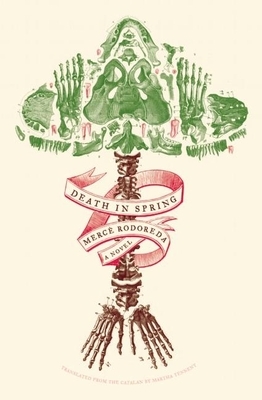 Discussing me Death in Spring by Mercè Rodoreda. Considered by many to be the grand achievement of her later period, Death in Spring is one of Merce Rodoreda’s most complex and beautifully constructed works. The novel tells the story of the bizarre and destructive customs of a nameless town–burying the dead in trees after filling their mouths with cement to prevent their soul from escaping, or sending a man to swim in the river that courses underneath the town to discover if they will be washed away by a flood–through the eyes of a fourteen-year-old boy who must come to terms with the rhyme and reason of this ritual violence, and with his wild, child-like, and teenage stepmother, who becomes his playmate. It is through these rituals, and the developing relationships between the boy and the townspeople, that Rodoreda portrays a fully-articulated, though quite disturbing, society.